In Sauris, in addition to Italian and the language spoken in the Friuli area, a fascinating, ancient language is still spoken today. This is a German dialect, belonging to the southern Bavarian language group. This is considerably similar to the Carinthian and Tyrolean dialects. On the one hand, the Sauris language (de zahrar sproche), over time, has been influenced by coming into contact with bordering populations, speaking Romance languages; on the other hand, this has preserved many archaic features, deriving from 12th century German (mittelhochdeutsch), as was spoken when the community was established. 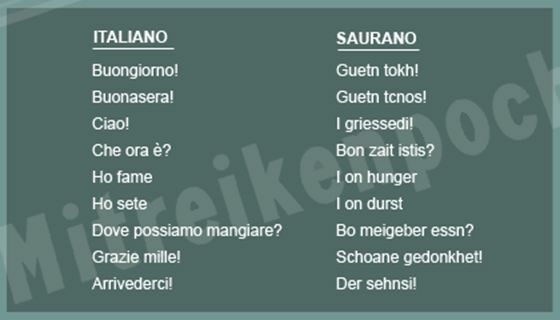 For this reason, Italian and foreign scholars alike have been studying the local language for over a century ago. It is thanks to their linguistic studies that it has been possible to identify the area of origin of the first settlers as well as the period of colonisation. For centuries, the language in Sauris was only spoken; its written record begins in the mid-19th century and it shows a remarkable wealth of poetry production that lives on to this day. As with other linguistic islands, also in Sauris, the 1960s marked the beginning of a downward trend in the use of the local language, especially among the younger generations. However, in recent decades, there has been a renewed awareness of the community’s roots and sense of identity, and has therefore given life to a series of initiatives relating to the re-introduction and enhancement of the value of local culture and language. For a few decades, a parish bulletin, “De Zahre reidet” (Sauris speaks) has been published and which often includes articles about the history and cultural peculiarities of the community. The “Zahre” Choir was founded in 1974 and it had the merit of not only safeguarding the performance of traditional songs, but also of the enhancement of the composition and performance of new songs, with lyrics written by local poets and music by contemporary Friuli authors. During the same period, the “Fulgenzio Schneider Cultural Association” was founded, which proposes activities and initiatives to enhance the value of the local language. The Municipality of Sauris has also established several projects to safeguard the Sauris language. In 2008, the “Zahrer Wörterbuch – Sauris Dictionary” was published, the fruit of the long research carried out by Prof. Norman Denison. For the past fifteen years or so, the language and local traditions of Sauris have been regularly taught in the local school. The language of Sauris is recognised and protected by the Italian State by means of Law n.482/1999 and by the Friuli-Venezia Giulia region with Regional Law n. 20/2009. One of the contexts in which the local language appears to be more evident and better preserved is in the place names. In old maps, in the archive documents, in the works written by local authors, there are numerous accounts relating to Sauris place names, that mostly date back to the occupation of this area by the first German-speaking settlers. The few non-German names are those that the Romance-speaking populations residing in the surrounding areas (Carnia and Cadore) had already given to certain locations. In fact, almost all of these are situated on the outskirts of the municipal administrative territory. The name Sauris (that in ancient documents appears in the forms of Saures, Sauras, Saurya), from which also the German form Zahre derives, seems to originate from a pre-Romance hydronym “savira” (“the body of water”). Also the form “Zahre” derives from the form “Saures”, by means of which the inhabitants define the location of their language of Germanic origin. In the local language, the districts and villages are called Dörf, “village” (Sauris di Sotto), Plotzn, “clearing in the wood” (Sauris di Sopra), Velt, “countryside”, Latais (Lateis), perhaps a Celtic word that means “hut, hayloft, alpine shelter” and Ame Lataise (La Maina). Place names also reflect community lifestyle and the close relationship with the territory. Many place names are linked with the main professions and territorial characteristics. There are frequently recurring terms that can be found in place names (e.g. bolt: wood; eibn: plain; eike: corner, small hill; laite: coast; olbe: malga, meadow; perkh: mountain; poch: stream, torrent; poudn: plain; schbont: newly-ploughed land, turned-over soil; tol: stream, valley through which a stream flows). These are often linked to other nouns or adjectives, adverbs, prepositions, or they are used in the diminutive form to specify which wood, stream or small hill is being referred to. In this way “Elble” is the “little alpine meadow” (malga), “Vourandrolbe” means “in front of the alpine meadow (malga)”, “Mörtarschbont” is the “newly-ploughed land in Mörtar”, “Durebolt” is the “dry wood” and “Eibnbolt” is the “flat woodland”, “Kholteprune” is the “cold spring”. In a community that once lived in a territory rich in game and the main source of sustenance was breeding livestock, it is not surprising to find many place names associated with the presence of animals. “Rinderperkh” means the “cattle mountain”, “Schofrestle” is the “short break for the sheep”, “Vokhepeidnle” means the “small plain for pigs”, “Hosneikele” means the “hare’s hill”. Sometimes, place names can give indications on the presence of animals that were once present in the valley and which subsequently disappeared. This is the case of Pehrntol and Pehrvole, respectively the “valley” and “trap” of the bears (a species that a few years ago shyly returned to frequent the Sauris area, after the last example was killed in 1911). The place names linked with plant species is just as rich, in particular with reference to woodland, in consideration of the importance that forest resources and the activities associated with woodland exploitation had. So, we can find “Tassach” meaning “a wood of fir trees”, “Pandertone” meaning “near the silver fir”, “Puechbolt” meaning “beech wood”, “Pame lerche” meaning “near the larch”, but also names that recall woodworking activities (“Andersoge” meaning “at the sawmill”, “Preitcpoudn” meaning “plank plain”). Also agricultural activities have left many traces in place names: names such as “Gersteribn”, meaning “barley landslide slopes”, “Pan khebaslan” meaning, “near the head cabbages”, or “Hoberhelbm” meaning “oat stem” originating from some of the most popular food-grade species cultivated in this area. Those who walk through the Sauris villages every now and again encounter wooden planks positioned near the entrances to homes, bearing words that always start with “PA”. These are called “hausnomen”, family names that characterise every home or groups of homes. These derive from the position of the building (e.g. “Poudnar” derives from “poudn”: “plain”, “Gruebar” from “gruebe”: “ditch”), from the profession or from the name or nickname of someone who lived there (“Maurar”: “bricklayer”, “Schuestar”: “cobbler”, “Sefn”: “Giuseppe”, “’S Lukas”: “Luca”). The particle “pa”, that precedes the name and corresponds to the German word “bei”, that means “near, at, at the home of”. Within the community, the “hausnomen” (family/home name) accompanied a proper noun, instead of the surname, therefore making it possible to identify people, especially in frequent cases of homonymy.